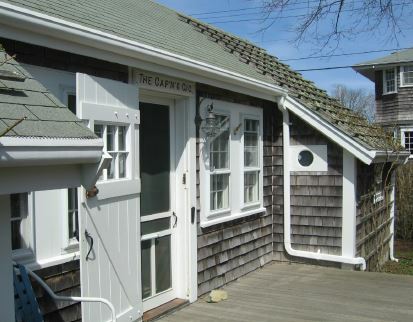 The cottage at One Lily Street—labeled “The Cap’n’s Gig” on the Sanborn Insurance Company map dated 1909, and spelled out fully as “The Captain’s Gig” on later maps—was one of more than two dozen cottages built by Edward F. Underhill in the 1880s, on Lily, Evelyn, and Pochick Streets in Siasconset. Fashioned in the style of the former fishing huts on Broadway, Shell, and Front Streets that had evolved into family dwellings, Underhill’s popular cottages were rented for the summer from the time of their construction to 1926, when his widow, Evelyn, and his daughter, Lily, sold them. Many of the cottages were rented season after season by the same families, who then purchased them when they became available. Whether that happened with The Cap’n’s Gig is not known. 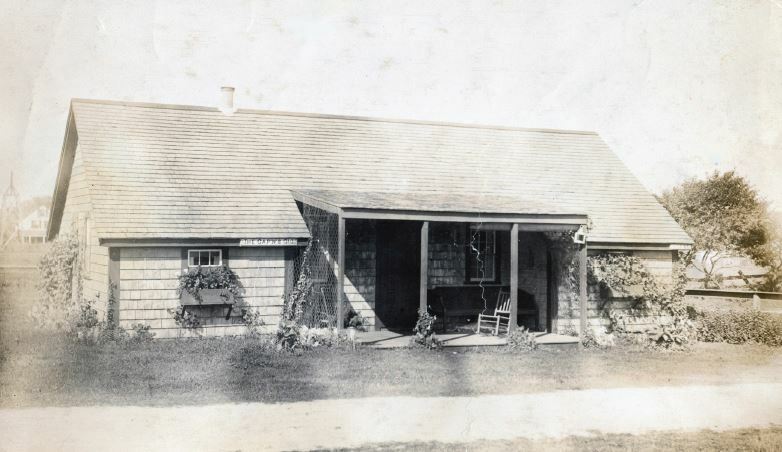 The first identified occupants of the cottage were “Mr. and Mrs. Russell L. Engs, five children and three maids, from Brooklyn, New York,” listed in the August 25, 1887, issue of the ’Sconset Visitor, a newspaper that unfortunately lasted only one season. The ’Sconset Pump, a daily paper published in the summer of 1888, also printed a list of cottagers; the only listing for Lily Street, which does not specify which cottage, was for Henry R. Tucker and his wife. Underhill’s compound was known as the “Actors’ Colony” in the late 1890s and early 1900s; rents were comparatively cheap, giving New York City thespians a place to go when theaters closed for the summer. The Cap’n’s Gig more than likely housed a stage family, but there are no Underhill cottage records extant to provide names. In 1926, when Evelyn Underhill and Lily Doubleday put the cottages up for sale, Elihu and Mary Fowler of Englewood, New Jersey, purchased what is now known as One Lily Street, for $3,500.